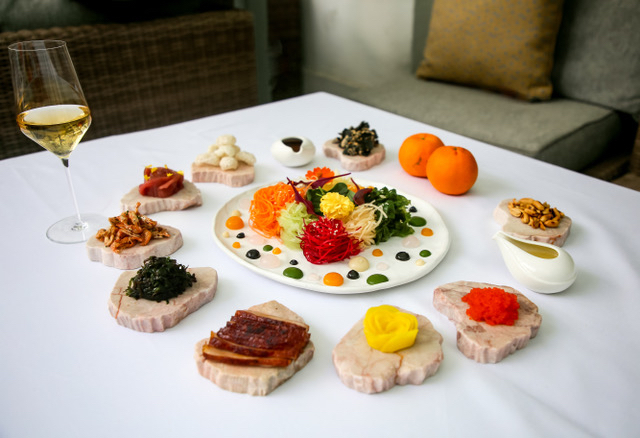 The Kaleidoscope of Prosperity is Yàn’s take on yusheng for the Year of the Pig. 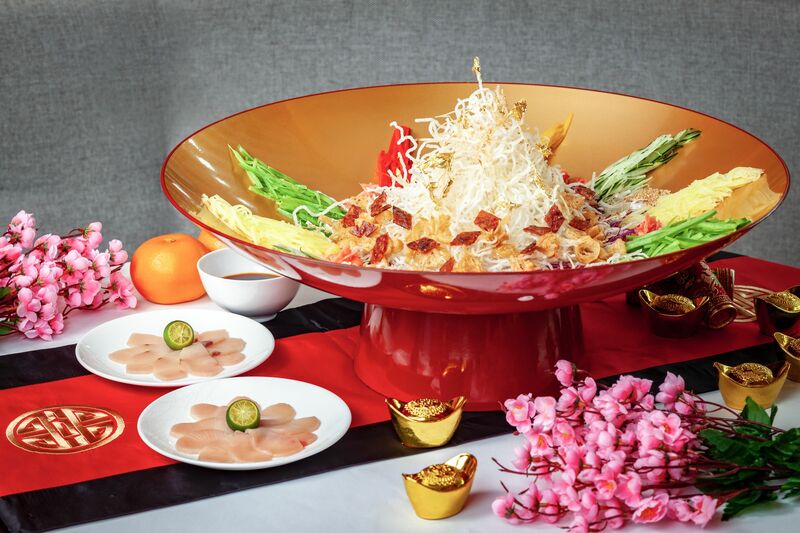 It’s a texture rich dish that is topped with a mountain of crispy fried vermicelli, surrounded by a vibrant medley of vegetables, sesame seeds, crispy youtiao, slices of fresh salmon or yellow tail. A sprinkling of smokey-sweet bakkwa is added, which is a nod to the year’s zodiac sign. This Lunar New Year, foster togetherness with Folklore’s “Do-It-Yourself” Popiah set. 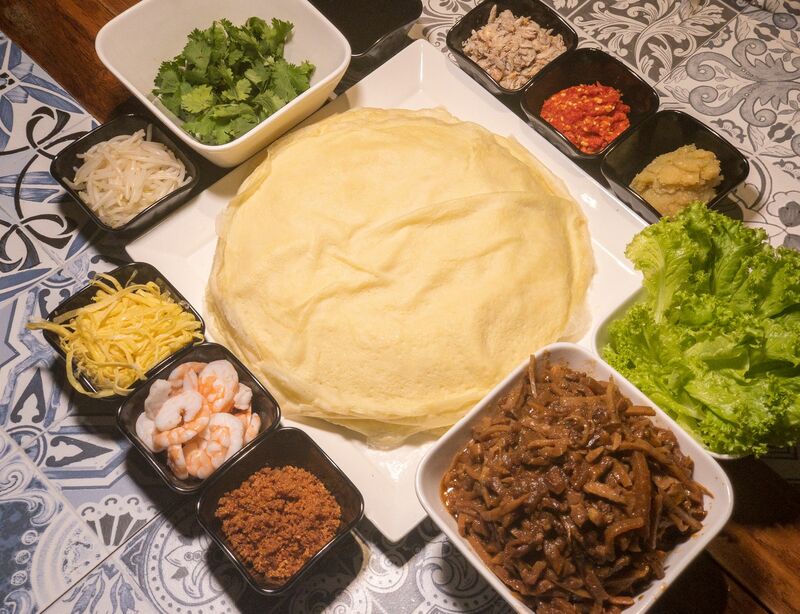 The set is good for four diners and features ten large house-made popiah skins, waiting to be filled with hand-shredded turnip, bamboo, and pork belly cooked in prawn and pork stock. Finish it off with condiments like crabmeat, prawn, shredded egg, minced fried garlic, chilli paste, and sweet sauce. Nothing says Year of the Pig quite like this dish from Goodwood Park Hotel. This mouthwatering platter features pork in two glorious forms with contrasting flavors and textures. 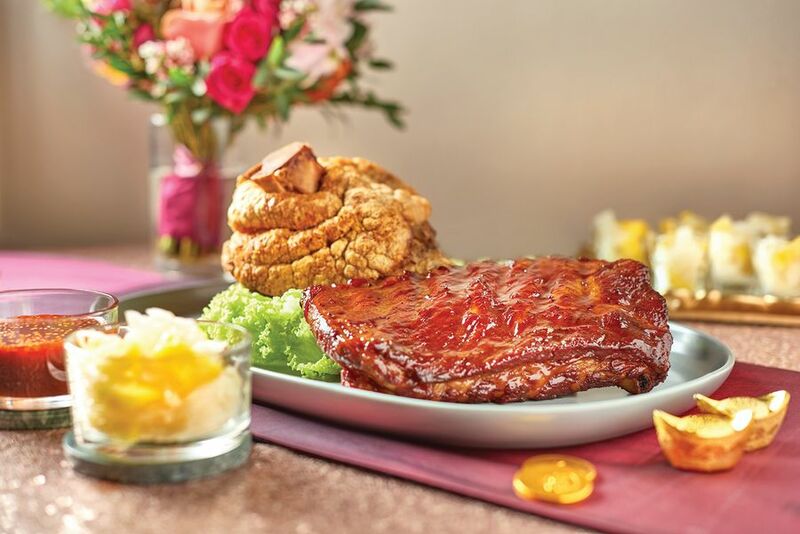 The deep-fried pork knuckle boasts crispy skin and tender meat, while the slow-baked ribs is incredibly fork-tender and irresistible with its honey butter glaze. 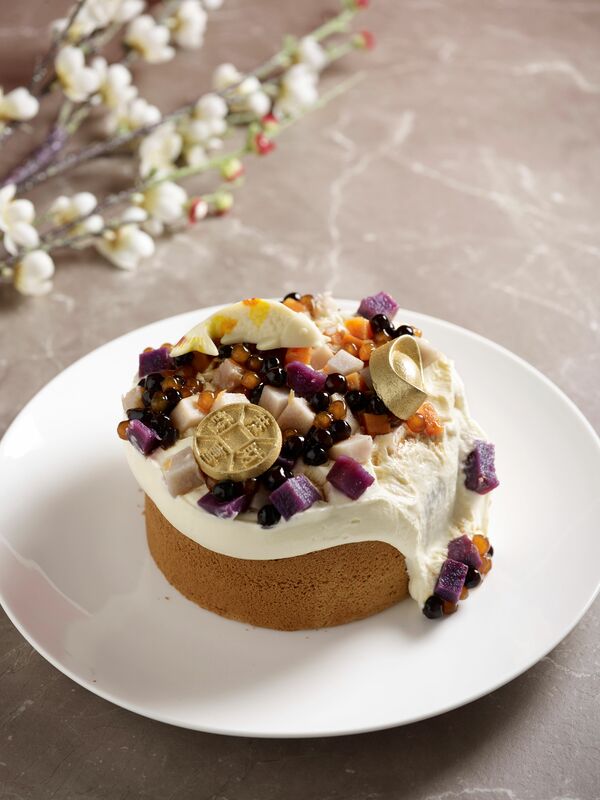 Chinese symbolism and French savoir-faire come together in this decadent cake from Antoinette. A fluffy chiffon cake is literally pouring with sweetness once the plastic sleeve is lifted up. An avalanche of salty-sweet cream cheese comes tumbling down, along with candied sweet potato, yam cubes, tapioca pearls, and gold-covered chocolate coins and ingots. The ubiquitous yusheng is given a luxurious spin at One-Michelin-starred restaurant Alma by Juan Amador. Inspired by Thai som tam (papaya salad), the yusheng consists of shredded green papaya, beetroot, carrots, and turnip. Indulgence comes in the form of chutoro and a plum and black truffle vinaigrette. Delicate edible flowers, cresses, and a yuzu kosho snow add a beautiful finishing touch. 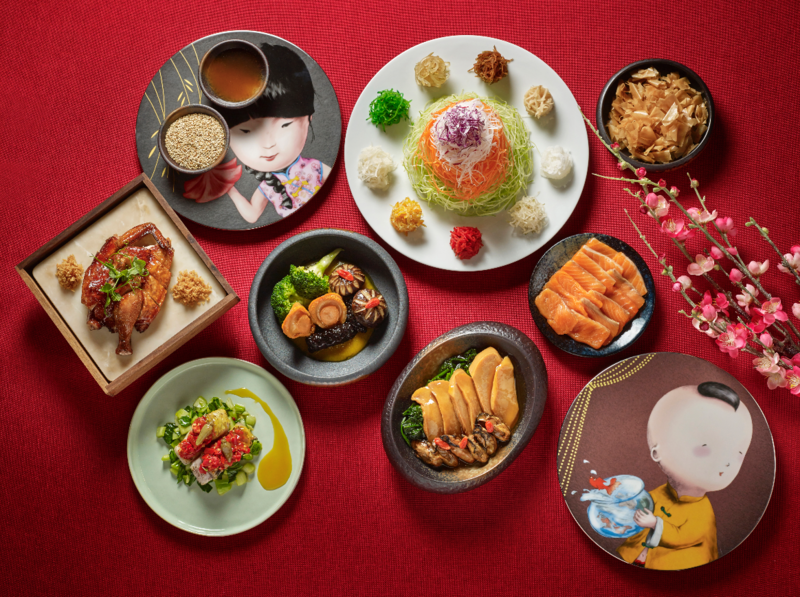 Choose between two lunch and two dinner menus this Chinese New Year at Yellow Pot restaurant, housed within the Anouska Hempel-designed Six Senses Duxton. The menu here is focused on natural ingredients and sustainability, which includes items like Crispy Red Snapper, Steamed Barramundi with Fermented Garlic Wine Chilli, Abalone, Sea Cucumber, and Broccolini, as well as their own take on yusheng with organically grown vegetables and sustainably sourced seafood. 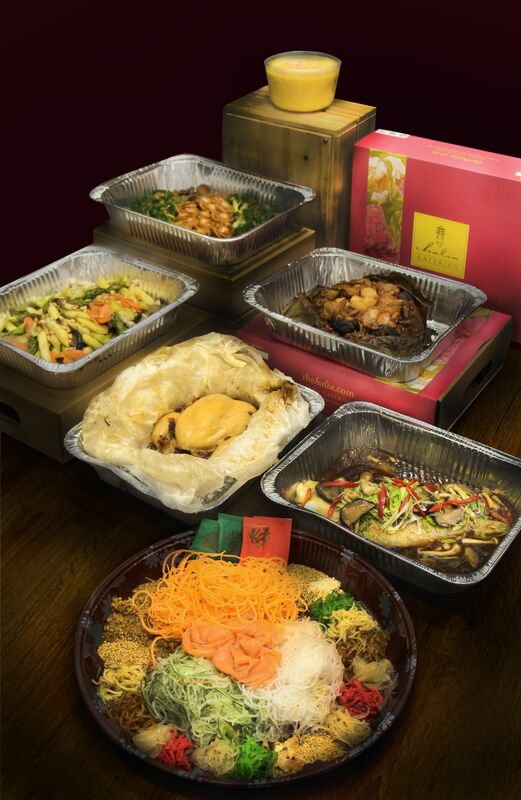 Take the stress out of preparing for reunion dinners with Halia's catering arm's Prosperity Reunion Feast and Golden Reunion Feast. Choose from a smoked salmon or abalone yusheng platter (which is also available as an carte option as well), alongside three mains, three side dishes, and one dessert. Each set is good for eight to 10 persons. 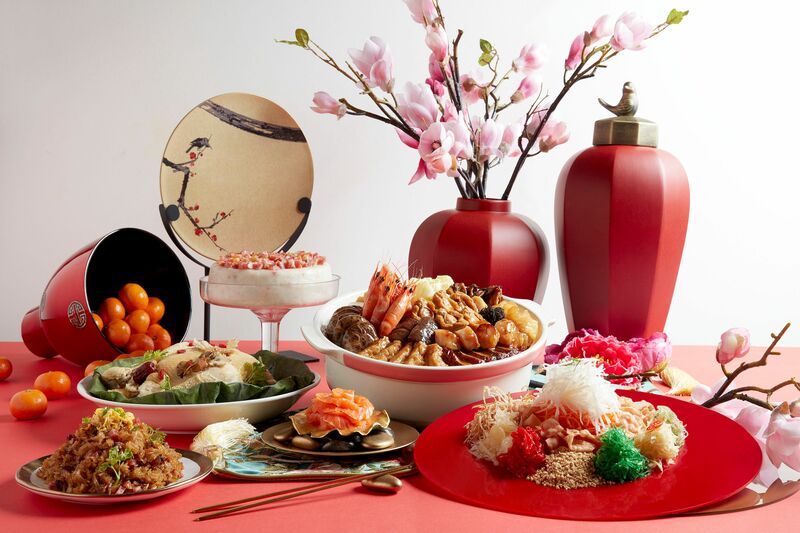 Crystal Jade promises an abundance of auspicious, inventive, and delicious takeaway offerings for Chinese New Year that can be easily enjoyed in the comfort of your own home. Choose between the Auspicious Reunion Feast Takeaway Bundle, the Eternal Bliss Platter that features a selection of cakes, or the Happiness Trio Bundle, comprised of cookies and tarts.